The Brigade Qm liquid-filled precision compass is protected in a sturdy non-magnetic case and slides on most wristbands. 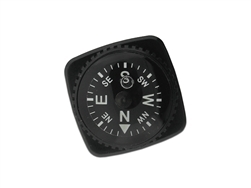 This handy accessory navigation backup compass fits almost all watchband straps or a Velcro® wriststrap. Sealed, liquid filled module is depth tested to 100 meters. Luminous cardinal points.